Production: Golden Way Films, A Golden Harvest presentation; colour, 35mm; running time: 96 minutes. Released January 1988. Shaorong; assistant directors: Paul Cheung, Cub Chin; art director: Piao Ruomo, Horace Ma; music: Michael Lai; sound editing: Deng Shaolin; sound recording: Zhou Shaolong; costumes: Wen Fenglan. Cast: Anita Mui ( Fleur ); Leslie Cheung ( Chan Chen Pang ); Alex Man ( Yuen ); Emily Chu ( Ah Chor ); Irene Wan ( Suk-Yin ); Patrick Tse ( Fleur's rich customer ); Wang Fu ( Seventh Master ); Tan Qianhong ( Chan's father ); Zhu Ruitang ( Chan's mother ). Jousse, T., "L'obscure objet du désir," in Cahiers du Cinéma (Paris), December 1989. Rayns, T., "Love unto Waste," in Monthly Film Bulletin (London), February 1990. Stanbrook, A., in Films and Filming (London), no. 420, October 1989. Kwan, Stanley, "Carrying the Past Lightly," in Cinemaya (New Delhi), Spring 1993. Chow, R., "Un souvernir d'amour," in Cinemas (Paris), Spring 1993. Eng, D.L., "Love at Last Site: Waiting for Oedipus in Stanley Kwan's Rouge ," in Camera Obscura (Bloomington), no. 32, September/January 1993/1994. Abbas, A., "The New Hong Kong Cinema and the Deja Disparu," in Discourse (Detroit), vol. 16, no. 3, Spring 1994. Atkinson, M., "Songs of Crushed Love," in Film Comment (New York), vol. 32, May/June 1996. Stringer, J., "'Centre Stage': Reconstructing the Bio-pic," in CineAction (Toronto), no. 42, 1997. There are seemingly mutually contradictory strands that run through Rouge. It is a deep, serious romance with a somewhat frivolous veneer (the romance being set in a gaudy, high-class brothel). It is also a ghost story, set in the modern environment of Hong Kong, that evokes virtually none of the gothic suspense or special effects that are associated with the genre since it is, at the same time, a love story of the wenyi melodrama genre . It is eerily nostalgic, recreating the rich textures and atmosphere of a 1930s Hong Kong brothel and contrasting these with scenes of modern Hong Kong, vastly changed and still in transition. That the movie comes across as an atypical Hong Kong production is a comment in itself. It differs from the normal run of Hong Kong movies that stress action and an easy facility with modern gadgets, fashions, and values. The film brings out the starkness of these contradictions and pinpoints an irony, by deliberately placing its narrative in the past and the present. In present Hong Kong, a thoroughly modern city, there is little or no trace of the past. Yet Rouge evokes a past through its tale of the ghost Fleur (Anita Mui), a high-class prostitute of the old world who reappears in modern Hong Kong to search for her lover, the dilettantish Twelfth Master Chan (Leslie Cheung). Fleur hardly recognises the city, and it is only with the help of a reporter and his girlfriend that she is able finally to locate Twelfth Master, who was supposed to have died with her in a suicide pact (having waited a day in the nether world—a cycle of fifty years on earth—Fleur decides to return to earth to look for him). Through Fleur's links with the past and a lifestyle that is now lost, the modern couple realises that Hong Kong has a history and tradition to call its own. But that history and tradition is marked by loss and betrayal, signified by Twelfth Master's failure to die with Fleur. Twelfth Master has become a lonely old man, subsisting on work as an extra in a film studio, thus reinforcing the suggestion that he is living in a private world of make-believe. The modern city of Hong Kong is of no relevance to Twelfth Master. At the same time, the couple that helps Fleur begin to question their contemporary values and the changes which have overcome their city. Thus, Rouge transcends its contradictory strands by signalling the desire of modern Hong Kong citizens for self-reflection and the sight of things beyond their preoccupation with hi-tech modernity and all things glossy and new. On this basis, Rouge is a rare achievement. Stanley Kwan's direction adds a graceful, stylish dimension. His third film, Rouge represents the director's breakthrough movie not only in the assured handling of generic elements (not to mention the various contradictory strands of the narrative), but also in the depiction of his central character, Fleur. Kwan had acquired a reputation as a woman's director, but his characterisation of Fleur as the cultured artist-prostitute puts him in a special group of filmmakers who combine social grace with impressionistic creations of memorable female characters. 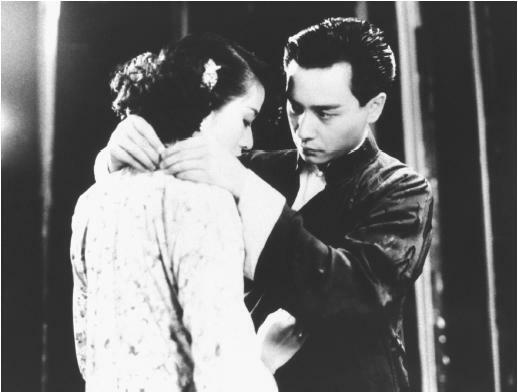 One thinks of Renoir, Truffaut, and Von Sternberg, but perhaps the most important aesthetic influence is Fei Mu (with a particular reference to Fei's masterpiece, Spring in a Small City) , whose mastery of the wenyi genre is invoked by Kwan not only through the stylish use of the camera and the mise-en-scéne, but also through use of a female character as the beguiling epicentre of the plot. In addition, Fleur is a character stemming from the fenghua xueyue vein of popular Chinese culture. Fenghua xueyue (literally, wind, flower, snow, moon: the term is usually abbreviated to fengyue) denotes a literary genre of light, frivolous subject matter. In cinema, it usually denotes a genre of soft-core entertainment. Rouge inherits the legacy of fengyue literature (and movies) depicting the brothels of old China and, in particular, Shanghai during its development as a treaty port in the 19th and early 20th centuries. Fleur is the Hong Kong Cantonese variation of the classic Shanghai sing-song girl: the exquisite details of behaviour and mannerisms of these old-world prostitutes are captured by Stanley Kwan. He wins the hearts of his audience with Fleur's highly refined style and melancholy as she searches for her lost lover—and longs for the old world in the concrete background of a hopelessly urbanized Hong Kong.